Y'all, I have kind of missed blogging. I was proctoring all week last week so I wrote a lot of posts then and scheduled them so I feel like I haven't talked to my blog friends in forever! I wasn't going to blog today. I went to DC (must write a recap!) and came home with some serious sinus issues. I stayed home from work yesterday and didn't go in until noon today, but I didn't leave until 8:15 (reception - event planning problems) so I still worked a full day. My husband asked me if I blogged and I said no, then remembered that I needed to blog every (week)day in May, so here I am. How about a few bullet points since forming full sentences with medicine head is kinda hard? New Girl finale, I wanted to love you, but I didn't. There weren't nearly as many quotables as there are in a regular episode and the Taylor Swift cameo was just dumb. I do love Nick and Jess though, so I am interested to see where they go next season. The Mindy Project, you got better as the season went on. I love Pastor Casey. And the fact that Mindy and Danny had a moment... so so good. Now I want to reread Is Everyone Hanging Out Without Me? Speaking of books, I am halfway through Bossypants. Love it. The perfect amount of memoir/non sequiturs/hilarity. I hate when a good blog turns into nothing but sponsored posts. I can't believe we are going to Atlanta the weekend after next. I am taking the whole week after Memorial Day off and I am really excited about it. I think this is the most time I have taken off work in a row since our honeymoon in June 2011. We come home that Wednesday, so I have a few days with nothing planned. Okay, enough rambly mumbo-jumbo. I am off to take some nighttime meds, snuggle my kitty, and go to bed. Hopefully I will feel better tomorrow and be able to write a nice post with actual paragraphs! I wish I started watching The Mindy Project when it started. I'm now stalking my Netflix account waiting to see when the discs are available! 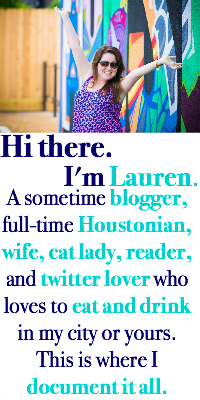 Houston blogger meet up? I hope next year I'm back in H-town and can attend these! Hey bullet points work for me! And are you going to the meetup? I don't have a dog or a kid btw, I'm still debating if I want to go. Or can... I think I may already have plans? Oh and I have no idea what to bring as a finger food either. Crap. Yes about the sponsored posts. I also have issues with other blogs that are bugging me lately but that'll get me in trouble (lol not yours obviously). Anyway! I'm glad you watch New Girl and Mindy Project too! I was slightly disappointed with both finales, so I feel ya. I was yelling at the TV when Mindy and Danny didn't kiss, but I guess it's good to have that suspense built up for next season. Ha, I love that you said that your dog is not meant for social situations! My dog is the SAME way. I thought I may be the only one with a dog that's better off staying at home!